Social Media in the Workplace: Friend or Foe to Productivity? Let’s set the scene: you pass by an employee’s desk and notice their attention is not on the computer in front of them, but on the phone in their hand. This is a common occurrence throughout the day and as their manager, you presume that their productivity has taken a hit even if the quality of their work says otherwise. Engaging with social media may seem like a workplace distraction, but workers will always need to take breaks. The water cooler of old has now taken several digital forms such as a check-in with the hive mind on Twitter, a quick round of a multiplayer online game, or scrolling through Instagram for aesthetic inspiration. 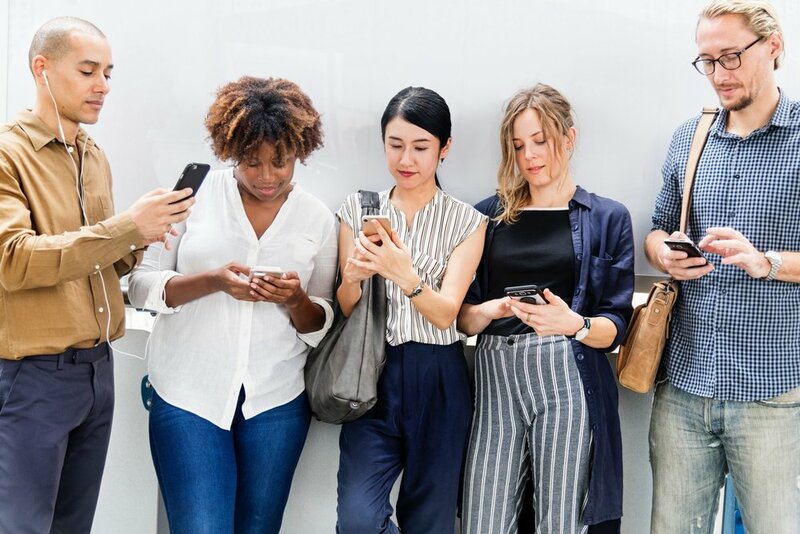 It’s true these brief creative distractions have been shown to increase productivity, but they also serve to connect team members who frequent the same platforms, providing emotional and psychological links. A recent Pew Research study showed that 34% of workers surveyed use social media at work as a way to take a mental break from their job. And of those, 17% used social media as a way to strengthen relationships with people at work. It’s a good idea for employers to seize upon this opportunity to harness powerful new platforms that foster stronger workplace rapport, instead of viewing them as the enemy of productivity. The breaks that we often think of, like getting a cup of coffee or a snack, may actually be signs of fatigue and cause further slumps. One study showed that the true benefit of a break occurs when people mentally disengage from the task at hand and instead engage in an activity that evokes positive emotions. So instead of griping about a work problem to a colleague, leave the office politics behind and do something enjoyable. Whether that looks like a walk outside in nature or laughing at a funny gif, it’s a way to sweep out the mental cobwebs. There are plenty of apps out there that offer up ways to pass along recognition to a colleague. Whether it’s a quick thumbs-up or other emoji of approval on Slack, or a written testimonial about a co-worker’s creative problem-solving on a particularly sticky project on Preciate, creating an electronic trail of positive reinforcement has the added benefit of boosting trusting relationships between workers. If an employee posts something positive about work on their social media channels, and their co-workers chime in with comments or likes, encourage them to link it to the corporate accounts, using tags or other links. These sorts of testimonials can increase your employees’ positive feelings about the workplace, as well as allow you to see what others are saying candidly about your company. And sometimes it’s just about fun. You could encourage theme days, like having everyone on a team snap a photo of themselves in a pair of sunglasses, or giving a thumbs-up, to create a grid group photo. And don’t forget to include hashtags: #throwbackthursday takes on new meaning when workers post photos of themselves from their first days with the company. Online tournaments linked to a social media platform, like a company-wide Words With Friends game, for example, can allow some of your more introverted workers to shine in a way that a rooftop happy hour might not. Don’t spend too much time bemoaning the loss of coffee room chit-chat. According to this study, taking breaks to the kitchen is still one of the most time-consuming distractions. And employees actually spend more time going to the bathroom than they do checking social media while at work. So focus on what your employees are doing right with their online time, and recognize the potential to foster a sense of collectivism. There are so many more tools are your disposal now than just a water cooler or a coffee pot. Millennials Are Challenging the Status Quo, Are You Ready? We grow the only thing that makes a person truly happy: stronger, deeper relationships. Copyright ©2018-2019 Preciate Inc. All Rights Reserved.